The m/v Baynes a bulk carrier of Jebsens shipping company was just completing the last leg of a six months voyage with a cargo of steel and bauxite from Mobile, Alabama, USA. bound for Rotterdam, Holland to discharge its cargo and change crew. It was a very foggy day in late January 1970 when we dropped anchor at the mouth of the river Maas waiting for fog to clear up and the arrival of the river pilot. The visibility eventually improved sufficiently to enable the 2 pilots to board Baynes and to weigh the anchor and to proceed slowly towards Rotterdam along the waterway of river Maas towards Rotterdam port. (inbound) After a while with the fog still lightly drifting in and out we heard Rotterdam port control on the vhf radio saying “Ross Bay”, “Ross Bay”, you are veering across the channel, this was repeated a couple of times. I had been on the port side wing of the bridge doing one final check of the ships emergency batteries when I heard the above message on the VHF. I immediately looked up and forward, I saw only light fog and a few seconds later a large dark shape loomed up out of the misty fog, from its shape I could see it was a oil tanker and it was coming straight for us, my life flashed in front of me, I thought this is it, think we are a gonner now, as I was thinking of tanker, oil, sparks, explosion, death. The tanker came closer and closer and eventually hit us and i saw sparks flying due to metal to metal contact as she moved down our port side ripping open our ships side under the waterline with her bulbous bow. The two ships remained locked together for a while and then eventually seperated. Baynes was seriously damaged with the forpeak, numbers, 1, 2, and 3 hatches filling up with water where we had been ripped open by the tanker like a tin of baked beans! There was a hole/gash under the waterline of some 183 feet from forward towards aft on the port side. Baynes started slowly to sink down by the head and the decision was taken to run the ship Baynes aground to prevent it from sinking in the waterway and thus blocking entry and exit to the whole port of Rotterdam. So we stayed on the sandbank at the side of the waterway being held in position by seven tugs to stop us slipping back off the sandbank with the tidal changes. The “Rossbay”, a Norwegian oil tanker had left Europort tanker jetty where it had discharged its cargo of oil, luckily for us after its discharge it stayed alongside the jetty to “gasfree” that is to clean its oil tanks and free the tanks of gas. A lot of times this is done when a ship leaves port on the way to pick up its next cargo. 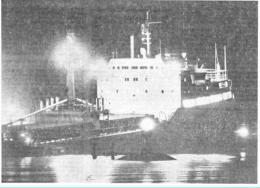 The tanker “Rossbay” apparently had a major failure of its main and emergency steering gear lost steering control and veered across the channel and collided with Baynes. As the waterway is quite narrow there was very little manoevering space and nowhere to get out of the way. I was kept extremely busy in the radio room with messages and radiotelephone calls all over the place, for three days, a real workout!! Baynes was kept on the sandbank for 3 days while we had divers on board diving down each hold to try and fit underwater patches on her hull, also had salvage experts on board and a very large crane trying to take off some cargo into barges to lighten the forward end of the ship. With a very strong tide on the third day the seven tugs could not hold Baynes on the sandbank any longer and she slipped off the sandbank with work not completed and we had no choice but to make a run for the dry dock in Rotterdam, luckily we made it ok. Next day the whole crew were, signed off the ship and we flew home from Amsterdam airport. The Baynes was repaired in drydock and I believe was later sold to Chinese ship owners.